The amount of time that passes before the grafts are placed in a hydrating media is often seen as a source of concern for poor results from hair transplant procedures involving follicular unit extraction (FUE). The extra process makes the procedure tedious for both surgeon and patient. Dr.UGraft technology includes a wide array of extremely advanced features to help avoid common surgical errors and produce better grafts for hair transplant success. Several patented and patent pending graft control features that maximizes the chance of complete dissection of the attaching anchoring tissue surrounding the hair follicle. Conventional punches rely on the surgeon’s ability to directly guide the punch down the course of the hair follicle with exact punch alignment. Dr.UGraft™ punches are engineered to pull the graft into the punch independent of the surgeon’s ability to gauge alignment, angles or depth. For this reason, the majority of grafts are already completely dissected free off their attaching anchors even with the slightest plunging of the punch by the surgeon. A carefully engineered gradient of external wall expansion that increases with depth. This expanded external surface is smooth and presents no cutting action. However as it rotates and advances downwards, it bluntly pushes away to separate stubborn anchoring tissues from the follicle. It peels off these anchors so to speak. This blunt method of separation minimizes the chance of having significant follicle attachments at the end of each single of The Intelligent Punch. The result is that minimal secondary action is required by the surgeon after the punch score. In many instances many grafts are virtually popping out of the punch holes and with one swipe of a gauze or swab as high as 80-90% of all scored grafts can be retrieved by the surgeon. Dr. Umar has defined this process as the FUE Swipe Maneuver. Both factors mentioned above are facilitated by a fluid irrigation system which lubricates both the internal and external walls of the punch business end. The revolutionary punch tip flaring which ensures that when the punch is plunged to attain depths that match or exceed the graft length, the chances of transection are minimized. Thus most scored grafts have a higher chance of complete separation as the operating surgeon is less concerned about going too deep into the skin. Watch the video precisely between 5.15 seconds and 5.45 seconds to see how grafts extracted with Dr.UGraft ™ can be easily collected via a simple swipe. The Dr.UPunch™ i, attached to the Dr.UGraft ™ Nurture handpiece, simultaneously hydrates and harvests hair grafts for a more efficient procedure. The physician is easily able to harvest grafts from the patient’s chest donor area, demonstrating the ability of the Dr.UGraft ™ system to combine speed and efficiency. Being able to collect grafts with one swipe has benefits that exceed those related to graft dehydration, such as shortening the length of a hair transplant procedure and preventing mechanical damage to the follicle. After scoring grafts, a physician or physician assistant typically goes over the donor area and plucks the grafts out one unit at a time, often with the use of forceps. This introduces more avenues for potentially poor results from hair transplant procedures. The swiping maneuver avoids poor yield after hair transplant by simplifying this process and replacing it with a simple swipe. In other follicular unit extraction procedures using basic graft harvesting tools, surgeons often have to pluck hair grafts from the scored area of tissue. These grafts can also have anchoring attachments to the surrounding tissue that necessitates additional tools or the use of some force. This competent of extract introduces the risk of mechanical damage to the hair graft. The swiping maneuver avoids poor yield after hair transplant by allowing physicians to quickly collect grafts, lowers chances of graft dehydration after scoring and increasing graft survival odds. The Dr.UGraft System features an intelligent punch, Dr.UPunch i ™, which utilizes a hybrid scoring action in order to ensure graft quality. The flared tip of this specialized graft harvesting tool pushes away anchoring attachments to the surrounding skin tissue. The result is grafts that seem to “pop” out of the scored area. This allows for the use of the Dr.UGraft ™ Swiping Maneuver. By collecting a number of grafts in this manner, the swiping maneuver decreases the need for forceps. Conversely, it increases the likelihood of growth after hair transplant. 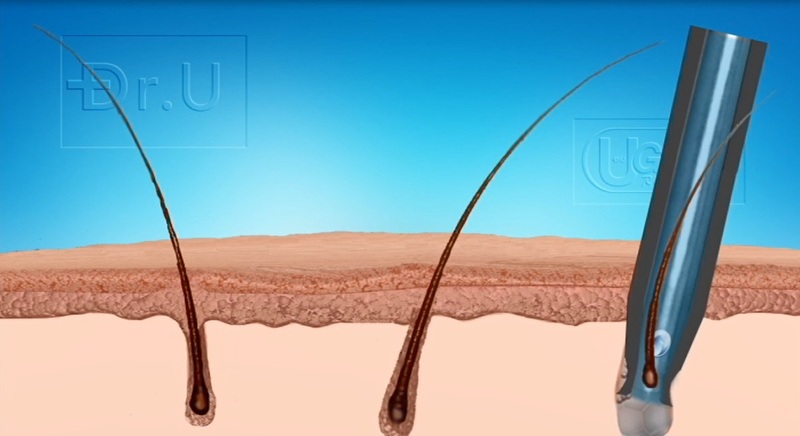 The Dr.UGraft ™ Swiping Maneuver avoids poor density after hair transplant with the help of the fluid integration system. After a hair transplant slow growth is a common fear, as it can signal poor graft survival. One of the main reasons for this is graft dryness or desiccation – once cut away from surrounding tissue, the graft is left without a blood supply, leaving a small window for the graft’s survival. With a 5-speed setting for continuous fluid drip, the Dr.UGraft™ hydration system actively avoids this outcome and sustains grafts for optimal survival conditions. The lubrication also facilitates graft removal by reducing friction and creating a water seal during scoring, helping grafts safely pull away from attachments. One of the ways in which the Dr.UGraft Swiping Maneuver avoids poor yield after hair transplant is through lowering graft our of body time. Another way in which the Dr.UGraft System avoids poor growth is due to graft hydration. The ability to safely collect hair grafts with a simple swiping motion allows for shorter, more efficient hair surgery procedures. This benefits physicians and patients alike. By reducing instances that necessitate individual graft retrieval, the physician can more efficiently extract the needed hair follicles for the next phase of hair transplantation. The patient benefits from quality grafts and an increased chance of graft survival after hair transplant. The flared tip of the Dr.UPunch i ™, combined with the internal and external texturing, enables the Dr.UGraft™ Swiping Maneuver by cutting away from the graft and gently pulling it away from anchoring attachments. This makes it possible to collect the hair grafts with the swipe of a gentle cloth. 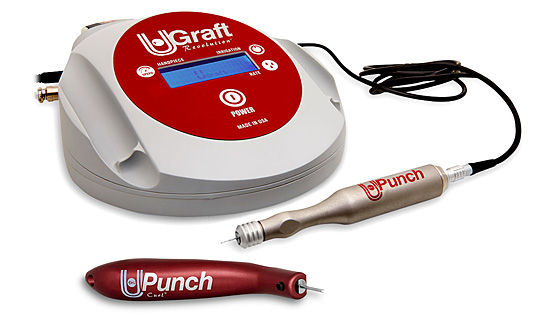 Following extraction with the Intelligent Punch (Dr.UPunch i ™), the Dr.UGraft ™ system allows for the collection of grafts with the Swipe Maneuver in order to prevent graft loss after hair transplant surgery. As seen in the photo above, a significant amount of grafts are able to be collected with the Dr.UGraft Swipe Maneuver. Additionally, the fluid integration of the Dr.UGraft ™ Revolution System keeps grafts hydrated in vivo, enabling the physician to continue making extractions with peace of mind. Rather than leaving grafts cut off from their blood supply, the fluid provides transitional sustenance for them. Once the physician is ready to collect the hair grafts via swiping, the fluid provides additional lubrication for an even easier process. Does the swiping motion damage grafts? No, the Dr.UGraft ™ Swiping Maneuver does not damage grafts. Rather, it rescues them from the potential of failure due to desiccation (air exposure) or the use of mechanical instruments (forceps). This is how the swiping maneuver avoids poor yield after hair transplant. Why do some patients report losing grafts after hair transplant ? There can be several reasons why one may report graft loss after hair transplant. Shedding tiny hairs within the first four months after a hair transplant is a normal part of the post-procedure timeline – this generally signals the beginning of new growth. However, outside of this timeframe, graft loss or nongrowth can be due to their failure to survive in the transplanted area. Can Dr.UGraft™ extract all grafts with one swipe? Not all grafts can be collected with a swiping motion. This can be due to several factors, including the strength and quality of attachments, donor area, and angle of growth underneath the skin. However, the grafts that do come out from the surrounding tissue after a swipe save the physician and medical staff valuable time during an otherwise length procedure. How many grafts are saved with the Dr.UGraft ™ Swiping Maneuver? The Dr.UGraft™ Swiping Maneuver allows for the rescue of grafts that could have otherwise failed to survive, either due to air exposure or mechanical damage. The numerical value can vary depending on the scope of a hair transplant procedure. 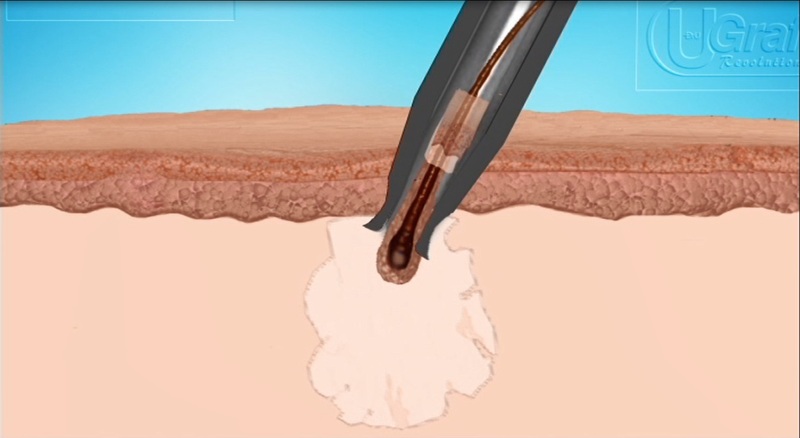 Learn how Dr.UGraft ™ corrects misalignment issues in hair graft harvesting. 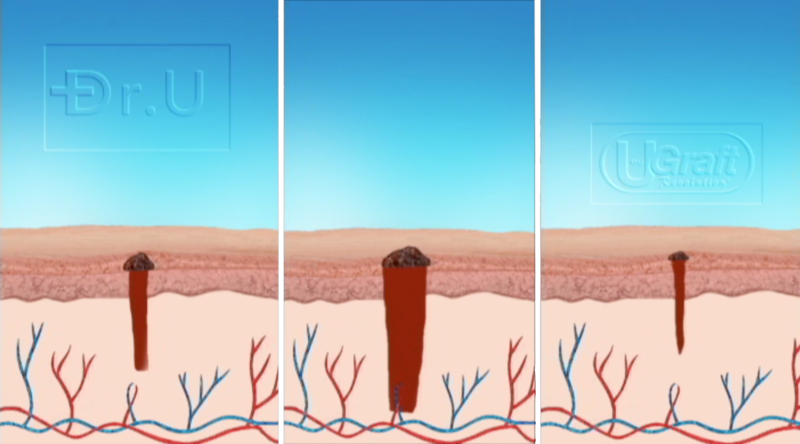 Find out how Dr.UGraft ™ extracts bulkier grafts without creating bigger wounds.